Designer(s) MAKAYEV, A. & STEPANOV, G.
Infos techniques The single-seat parasol monoplane had an open cockpit, all wooden structure, sparless wing covered by plywood and oval fuselage cross-section. The tail unit was conventional with elliptic surface contours. Landing gear consisted of a main and a tail skid. Histoire résumée During the years of 1932-1934 the Aviation Scientific and Technical Society of the Moscow Aviation Institute (АНИТО-МАИ: Aviatsionnim Nauchnim Indzenierno-Tekhnitseskim Obtsestvom, Moskovskij Aviatsionnij Institut) designed and built three gliders: the "MAI-1" training glider, the "MAI-2" two-seater glider and the "MAI-3" light performance glider. All were built under the supervision of N. N. Fadeeva and N. F. Chekhonin. 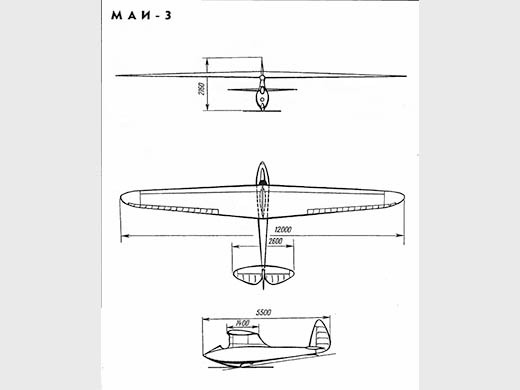 The "MAI-3" lightweight sailplane was designed by students A. Makayev and G. Stepanov. The testflights were done by D. Kosits. The glider had performed well and and it was decided to fly it to the Crimea to participate at the glider contest. However, the tow pilot Majewski and the pilot of " MAI-3", Yegorov, had to abandon the flight at Tula, as airframe vibration was experienced on the tail. 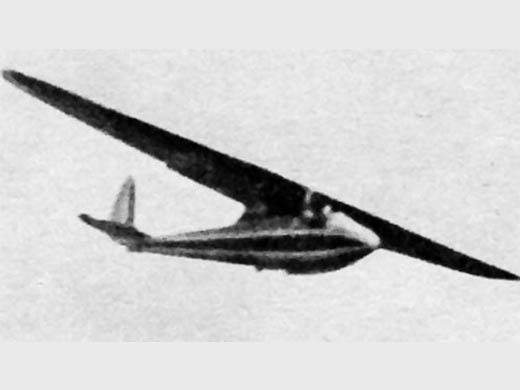 After minor repairs the trip was continued and the "MAI-3" was able to participate in the Xth All-Union glider contest, which opened in Koktebel at September 1, 1934.
par KRASILSHCHIKOV, A. P. (2005) [p. 327. Specs].